Recently I bought Anki Cozmo. This little tiny robot is amazing and a great companion on your desk. Cozmo comes with a great personality. He is full of fun, he plays games with you, do tricks, animate and makes a lot of joy. Cozmo comes with a Camera that can detect faces and greet people and pets. It also has a SDK which allows you to customize Cozmo and create cool Apps and IoT connected programs. Note the HTTP forwarding address shown in the terminal (e.g., http://4916890d.ngrok.io). This is required while creating the IFTTT applet. IFTTT is a web service that lets you create chains of simple conditional statements, called applets. An applet is triggered by changes that occur within other web services such as Gmail, Facebook, Instagram, or Twitter. An applet may send an e-mail message if the user tweets using a hashtag or copy a photo on Facebook to a user’s archive if someone tags a user in a photo or it can trigger an support IoT device to a specific action. In this example, we will create custom IFTTT Trigger and Action using Maker Webhooks feature. Select “Maker Webhooks” as your service. Under “Choose a Trigger”, select “Receive a Web request”. Select “Maker Webhooks” to set it as your action channel. Connect to the Maker channel if prompted. Click “Create Action” then “Finish”. Finally, run the Jenkins job to test the setup. In response to the ifttt web request, Cozmo should roll off the charger, raise and lower his lift, announce the status, and then animate and light-up the cubes. You can also connect CI tools like Travis or Circle CI using curl command to Maker endpoint. We can add more actions to this web server and make Cozmo thrill. This series was originally posted on Sauce Labs Blog. This is a reblog with revisions. So far we executed features in a local environment. Now this is just one feature, there could be 100s of such and you might want to run these features frequently. Setting up dedicated machine may not be always possible and involves costs. Sauce labs, the company behind Appium provides you an ability to run Appium tests in a virtual environment without needing you to setup everything from scratch. This also saves you costs for setting up your own infrastructure. But at times you may also want to run these on a local environment, how do we support both running in local environment and sauce? //Create an instance of RemoteWebDriver and connect to the Appium server. 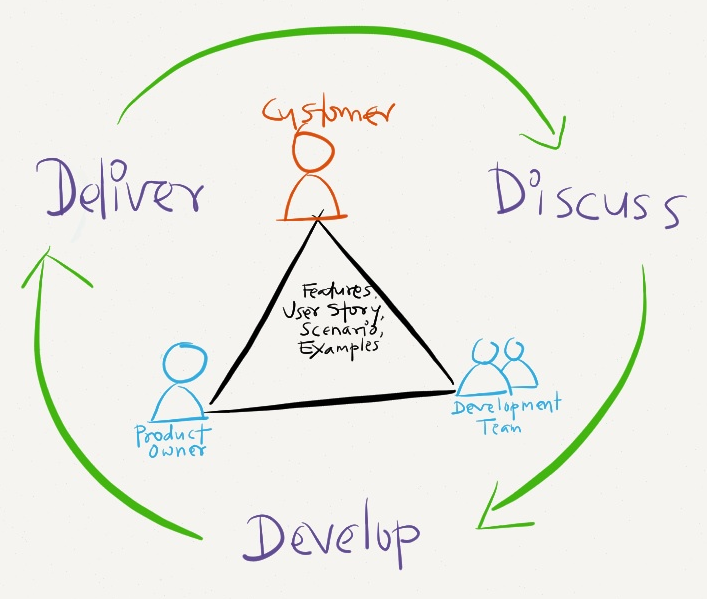 Continuous Integration (CI) is becoming a widely accepted practice in agile projects for early feedback. 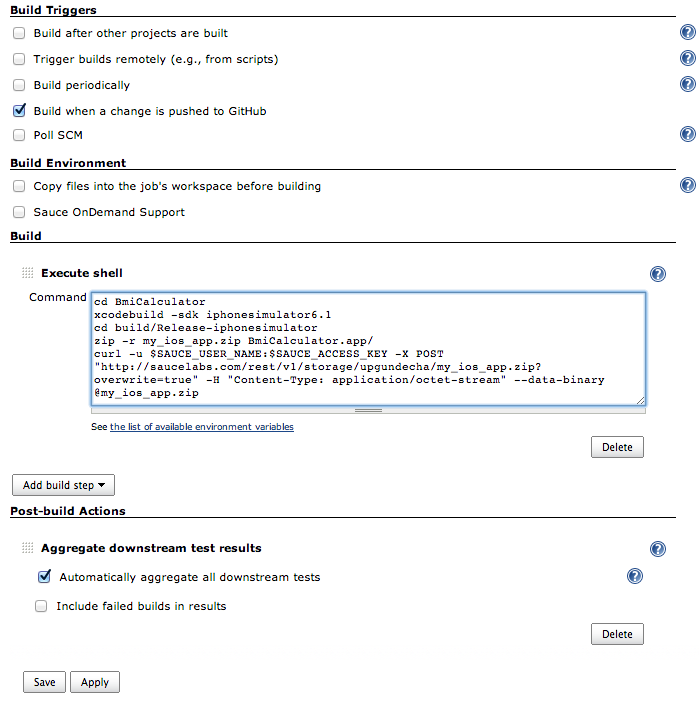 Each integration is verified by an automated build to detect errors as quickly as possible. CI also gives great visibility to all stakeholders about the overall health of the project and its progress. 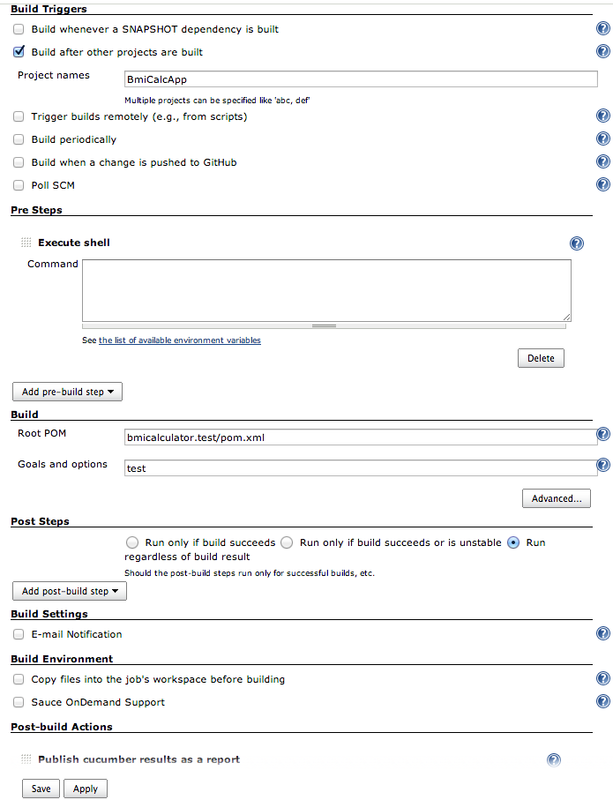 Jenkins is one of the popular CI tool used by the development teams. 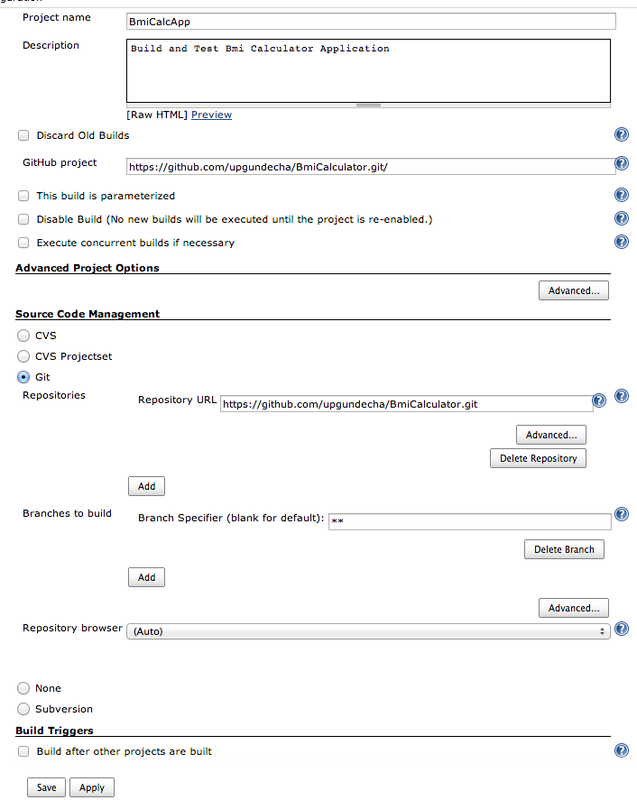 Let’s setup a build and test jobs on Jenkins for this project. We can write automated acceptance tests for native mobile Apps with Cucumber, Selenium WebDriver API and Appium. These can be run on local, remote or Sauce Labs environment. We can also get benefits of whole team communication and early feedback by applying these methods in mobile application development. Welcome to the second part of Automated Acceptance Testing iOS Mobile Apps with Appium, Cucumber-JVM, Jenkins, and Sauce Labs. In this post we will define steps for the feature we identified in Part 1. 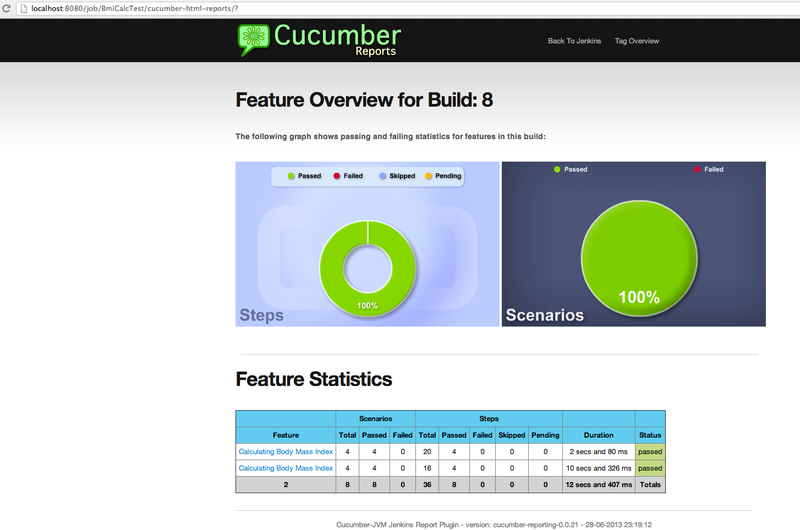 We will run this feature with Maven and look at Cucumber results. Cucumber drives features & scenarios with automated steps using step definitions. Step definitions are glue between the steps described in a Scenario to the actual automation code which drive the App either through API or User Interface. The App user interface many not be ready at this time. While development team is busy in developing the App we can create place holders for the steps from the sample scenario as suggested by Cucumber. When this feature is executed by Cucumber, it will show these steps as pending. Once developers are done with the initial version of the App and it’s ready for testing we will refactor these steps and add code to drive the user interface of the App using Appium and Selenium WebDriver API to check the expected behavior of the App. 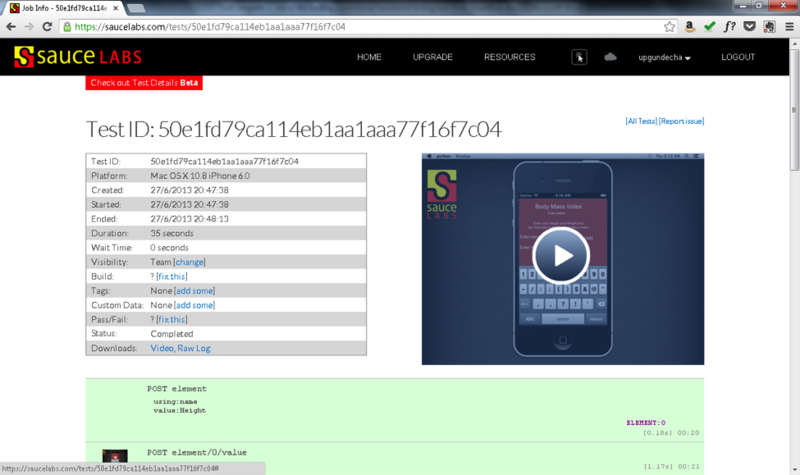 In the next post we will explore how to run Cucumber features with Sauce Labs cloud and Jenkins. This series was originally posted on Sauce Labs Blog This is a reblog with revisions. Mobile application development project can leverage on these advantages in building mobile apps in shorter cycles and feedback loops to build a successful applications. In this series of posts I will explain how you can apply automated acceptance testing to iOS native applications using Appium and Cucumber-JVM. You will also see how these applications can be tested in cloud using Sauce Labs platform. Cucumber-JVM is a pure Java implementation of original Cucumber BDD/ATDD framework. It supports the most popular programming languages on the JVM. It’s already been used by various teams along with Selenium WebDriver for testing Web applications. Cucumber support creating features files which are written in a ubiquitous language understood by the whole team. These feature file describe the expected behavior of the application and are used as tests to run against the application. Cucumber can be used for API, integration and functional testing of the application. 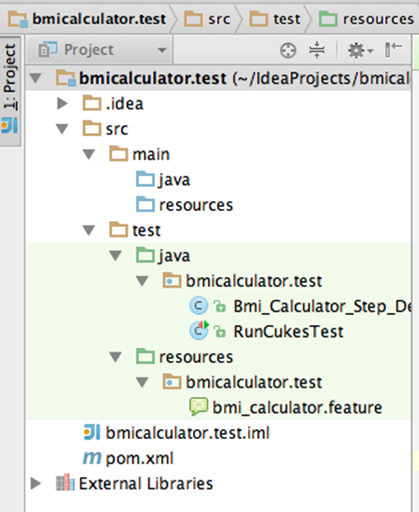 In this example we will see functional testing of a sample native iOS App using Cucumber-JVM and Appium. 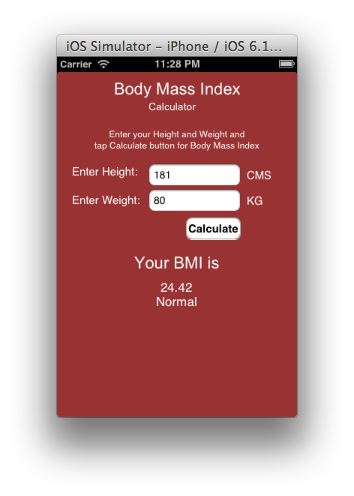 This example is based on a sample BMI Calculator application which is used by Health & Nutrition specialists to calculate the Body Mass Index of patients by submitting Height and Weight values to the App. This will add Cucumber-JVM and Selenium dependencies to the project. In Cucumber-JVM specifications or requirements are expressed in a plain text, Given/When/Then kind of syntax known as Gherkin language (https://github.com/cucumber/cucumber/wiki/Gherkin) which is understood by the whole team. So let’s create a feature file for above feature in the project. Every feature file contains a single feature. A feature usually contains a list of scenarios. Every scenario consists of a list of steps, which must start with one of the keywords Given, When, Then, But or And. Scenarios express expected behavior of the system under given conditions. In addition to a scenario, a feature may contain a background, scenario outline and examples. Our example scenario contains Scenario background and examples for number of BMI calculations representing each category. This scenario outlines allow us to more concisely express these examples through use of a template with placeholders. In this example Calculate Body Mass Index is run once for each row in the Examples section beneath it (not counting the first row which is a header). This is similar to data driven testing. In next part, we’ll see how to run features with Maven, and enter step definitions.